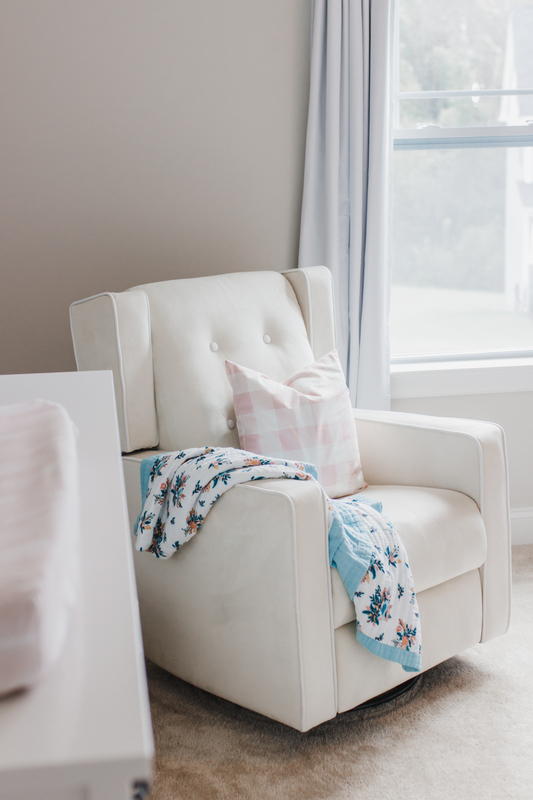 A Beautiful Baby Girl's Nursery in Blue and Blush Tones | Glitter, Inc.
Several months back I found myself in Raleigh, meeting at the home of a woman I had never met, but whose work I admired from afar (Carrie is a gem, y’all), for my first ever Mastermind. I’ve worked for myself full-time as a blogger for more than three years now, and truthfully, working from home can feel relatively isolating. Trust me when I say that my days are full with work and babies; still, seeing and talking to like-minded grownups – it can feel positively invigorating. 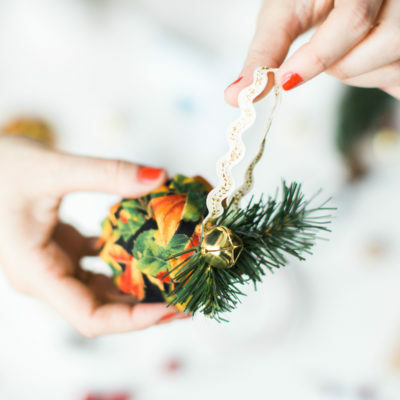 Truly, after that first Mastermind, I kept wondering what on earth had taken me so long to step out of my comfort zone and chat business with other likeminded women. I felt totally charged, inspired, and in awe. One of the many super talented ladies that I met with that morning, and several times since, was Allie Roepe, owner of Crafted Photography and executive director of Restored: Purposefully Equipping Professional Moms. Allie is one of those moms who makes it all look effortless. Though we all spend our mornings each month discussing the struggles, the highs and the lows; Allie manages to juggle it all with such grace, and her passion for what she’s doing is palpable. Pregnant with her second baby girl as well (yay, girl moms! 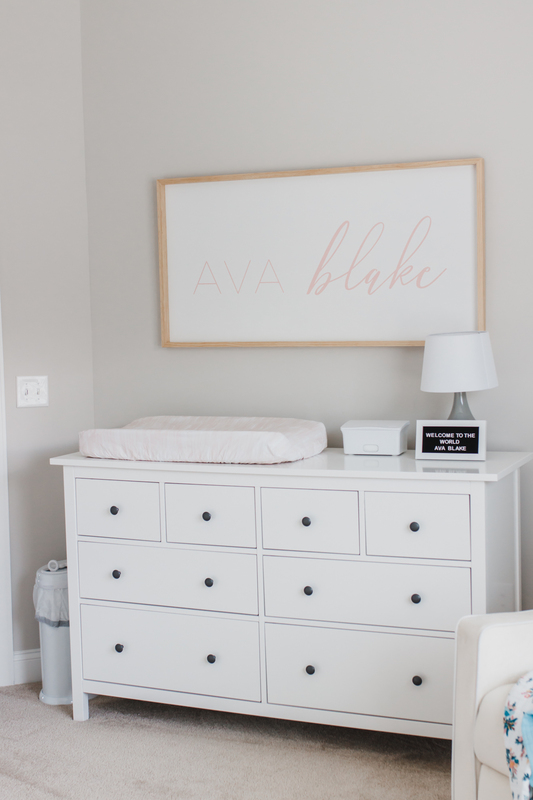 ), I knew I just had to share her sweet little girl, Ava Blake’s nursery; because much like everything else Allie does, the new babe’s nursery is nothing short of stunning. 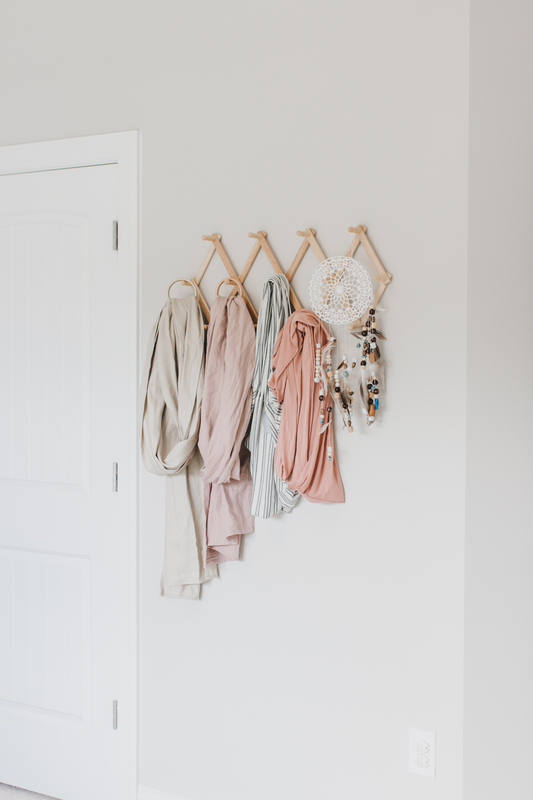 I’m so grateful to Allie for sharing a glimpse into the beautiful nursery that she and her husband created, and I think you’re absolutely going to love the beautiful and subtle ways Allie ties in dreamy shades of blue and blush pink to create such a perfect little haven. 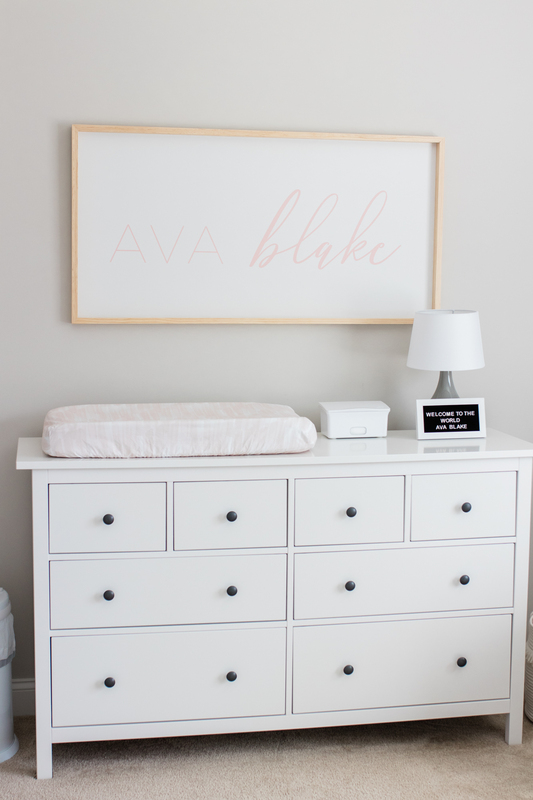 We had so much fun designing and curating Ava Blake’s nursery together! My husband has a design degree and is also very handy so he definitely wanted to put his own stamp on the room. 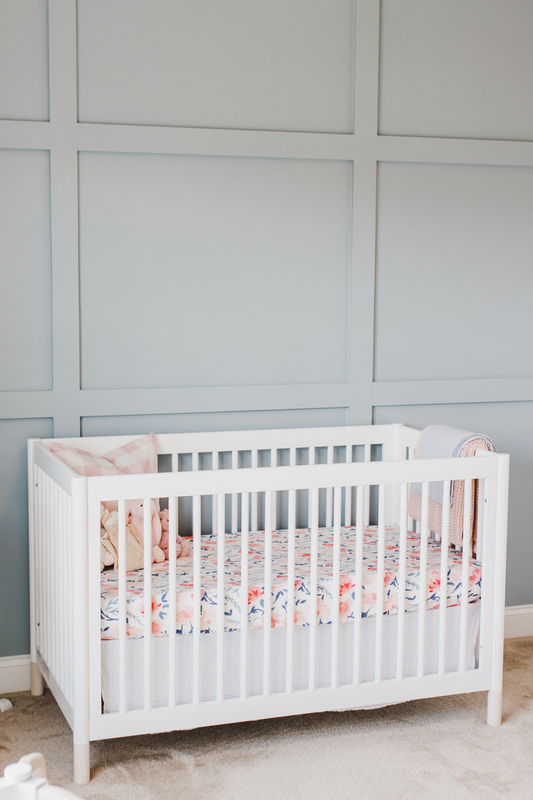 He and his brother designed and built the accent wall behind the crib from scratch – I couldn’t be happier with how it turned out! That was the first thing we designed for the room and the rest came together from there. I love the idea of using blues and grays in a girl’s room so that was our base color (Blue Mountaintop by Sherwin Williams). 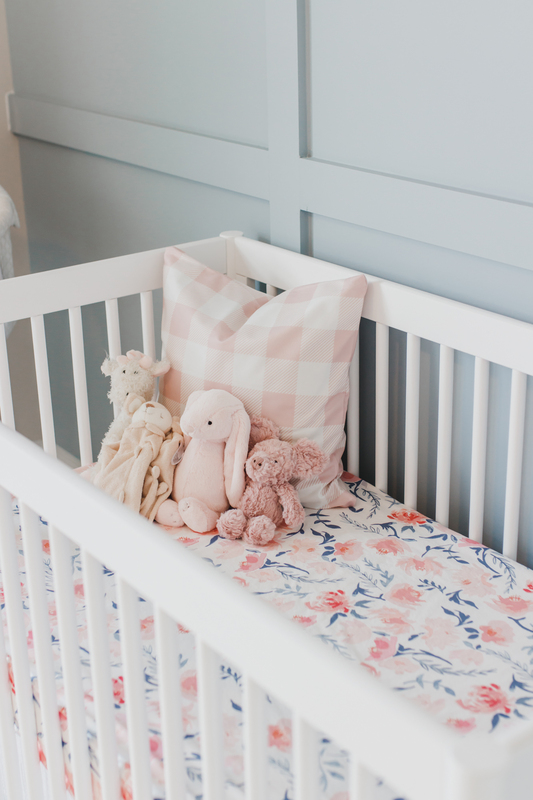 I found the crib sheet next which tied in the blues from the wall but also added some feminine splashes of soft pastel pink. Honestly, I like pairing patterns together and I love the unexpected gingham pillows paired next to the florals in the room. I think both patterns together really work! Also, I knew I wanted Ava’s room to be very soft and serene feeling with a minimalist, slightly bohemian feeling. Babywearing is so important to me and I couldn’t wait to display my gorgeous Wildbird ring slings and Solly Baby wrap. 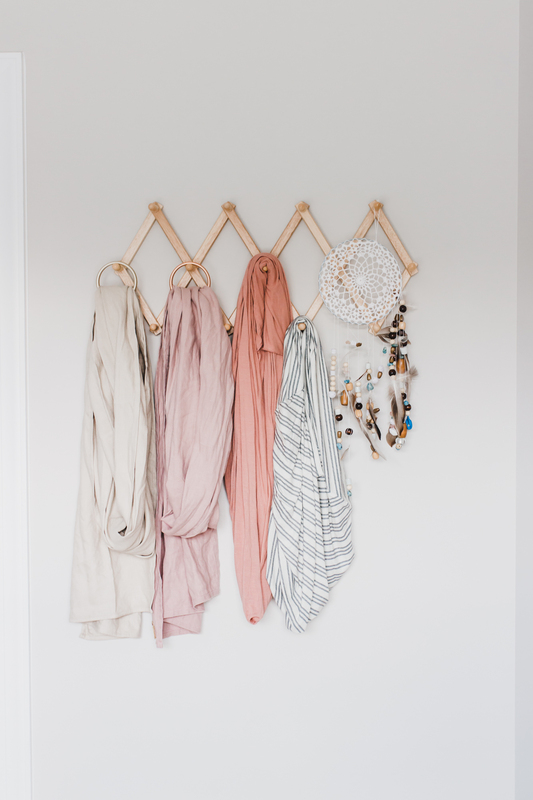 Furthermore, I love the bohemian feel of the accordion coat rack that I used to display these beautiful wraps. I think it’s a little bit unexpected in the room. The dreamcatcher also hanging on the rack was made by our friends and family at my baby shower. Everyone wrote down a prayer or wish for Ava and then hand-strung each beaded cord and added it to the ring to create the dreamcatcher. I love how special and personal this gift is in her room. Finally, I knew I wanted lots of white in the room – which may or may not prove to be a practical choice! 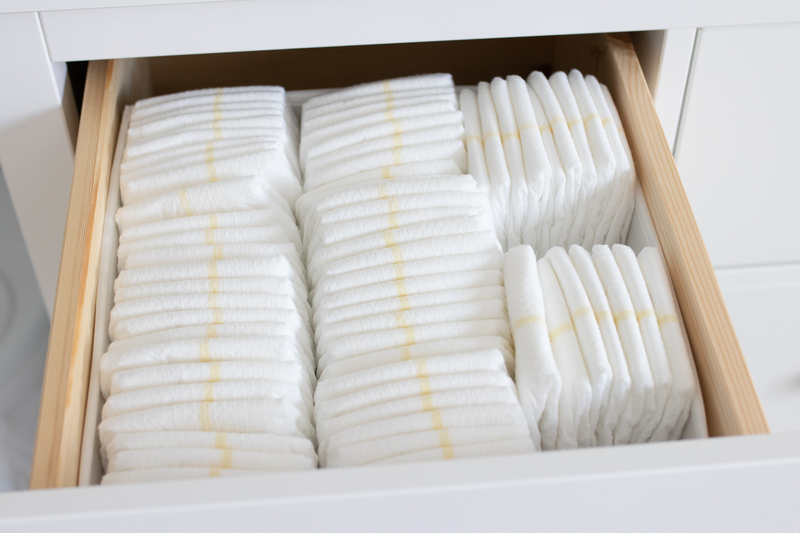 I love the simplicity of the white Babyletto crib and the softness of the cream colored glider. 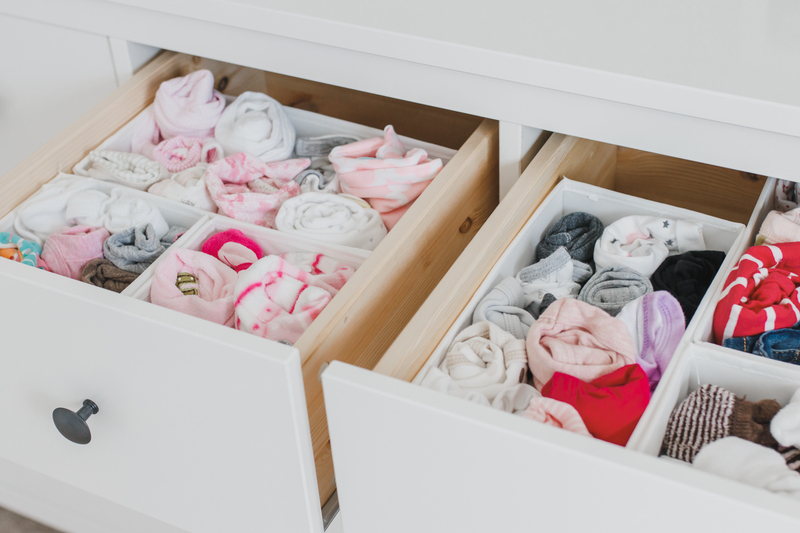 The white dresser is also very simple with clean lines. 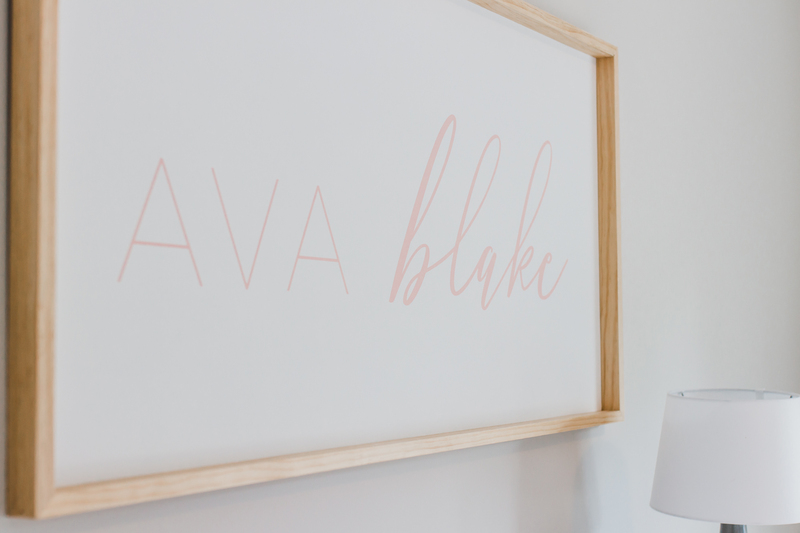 The final finishing touch for the room is a custom-made, hand painted sign with Ava’s name that my husband designed and our good friend and neighbor created for us. I love that it’s completely unique and ties in the soft pink color we used throughout the room. Ava is our second baby girl and we can’t wait for her to arrive in just a few short weeks! Congratulations to Allie and her whole family! 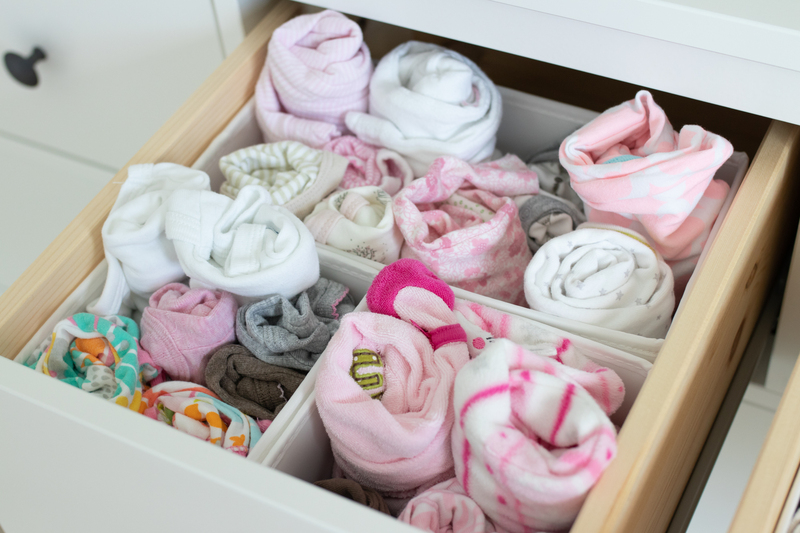 Now tell me: are you in love with Ava Blake’s beautiful nursery? 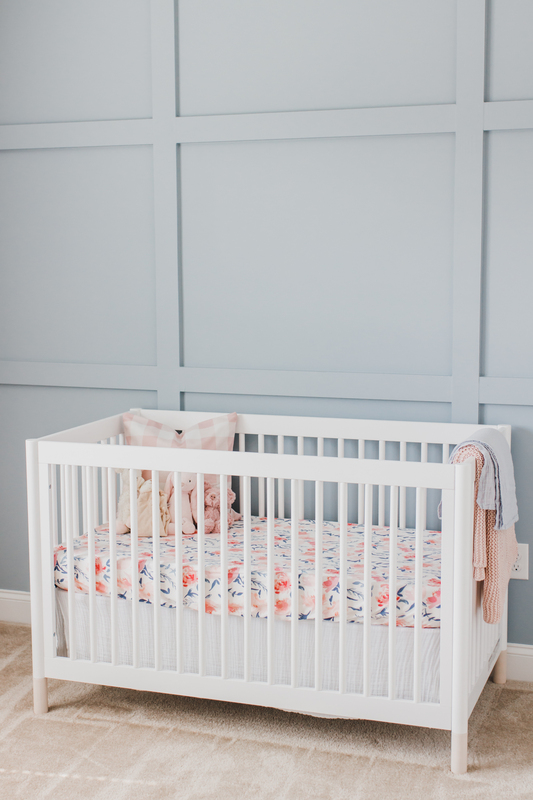 How perfect is that hand-crafted soft blue wall as a backdrop to the more modern white crib? 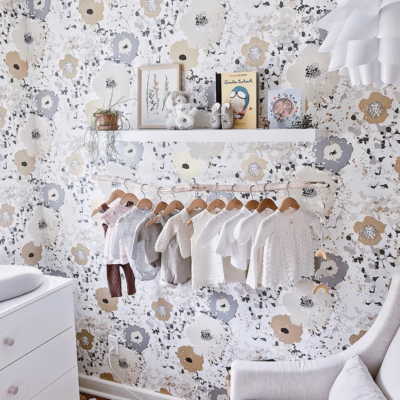 Love this nursery design post? 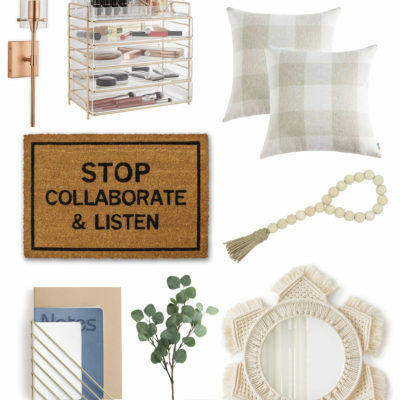 See more home tours, home décor tips, tricks, and plenty of design inspiration right here.